The Japanese prime minister branded North Korea a 'grave threat' during his visit to London, after a missile test closed down the Tokyo subway. Shinzo Abe called the failed test 'absolutely unacceptable' and a 'grave threat to our country', as he spoke at the end of his three-day visit to Russia and Britain. One of Tokyo's major subways systems shut down all lines for 10 minutes after receiving warning of a North Korean missile launch. Tokyo Metro official Hiroshi Takizawa says the temporary suspension affected 13,000 passengers this morning. Service was halted on all nine lines at 6:07 am and was resumed at 6:17 am after it was clear there was no threat to Japan. Takizawa said it was the first time service had been stopped in response to a missile launch. Train services are generally suspended in Japan immediately after large earthquakes. The transport shutdown came after a North Korean missile test failed this morning. 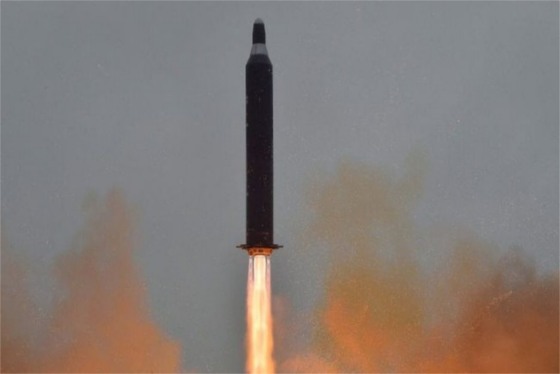 The ballistic missile was fired to the northeast around 5:30 a.m. from the Pukchang area, north of Pyongyang, according to Chief Cabinet Secretary Yoshihide Suga.